It's like trying to listen to some morality lecture from a priest who had his hands under your skirt during First Communion practice. Or all that stuff about the sanctity of marriage from an aging uncle whom you had seen at the casino with a young lady definitely not your aunt. Welcome to the world of the editorial writers at the nation's corporate media as Chicago's teachers hold out for a third day in the Chicago Teachers Strike of 2012. The nation's — and Chicago's — major newspapers have weighed in against Chicago's teachers strike, which they know is definitely wrong. And the result isn't pretty when measured on the hypocrisy scale — except perhaps as an example of how the "one percent" really revels in its own hypocrisy and doesn't realize how exposed its own hypocrisies really are. Chicago Tribune Vice President and Editor Gerould W. Kern, above, introducing the audience to the forum presented on September 13, 2011 featuring Jean-Claude Brizard and Karen Lewis. 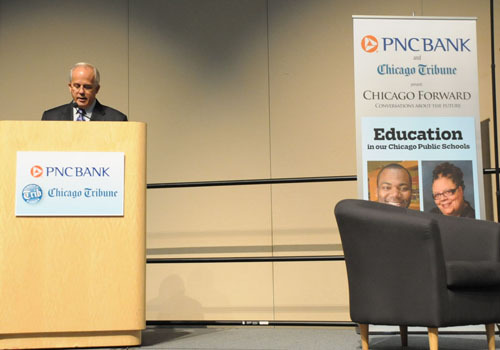 The event, sponsored by the Tribune and PNC Bank, proved to be a disaster for the Tribune's favorite "Chief Executive Officer" at CPS, as Brizard showed that he was unable to venture beyond a few canned talking points when confronted with the complex issues facing the Chicago Public Schools. During the subsequent year, Tribune editors protected Brizard from Karen Lewis and a serious examination of the policies of CPS. Like his counterparts, Kern is hostile to unions and in in favor of privatizing public education and charter schools — but not in the wealthy suburbs where he and his colleagues live. Substance photo by George N. Schmidt.At the Chicago Tribune, for example, where the editorial board's members generally live in Chicago's northern suburbs in towns where you can't buy a home for less than two million dollars, the tough guys are prodding Chicago Mayor Rahm Emanuel to Stand Tough (editorial September 11, 2012, see below). At the New York Times, the same is true about where the editorial pontificators live, but from a different part of the country (editorial September 12, 2012, see below). CHICAGO'S TEACHERS' STRIKE IS A BAD BAD BAD THING. AREN'T YOU PAYING ATTENTION. YOU ARE DOING A VERY BAD THING! STOP IT NOW! Over the weekend, Chicago Public Schools leaders offered teachers a sweet deal that would make most workers in the city envious. Teachers stood to reap a remarkably generous 16 percent raise over four years in a new contract. Guaranteed. Ask working stiffs on the street: Would you take that deal? Sure they would. Chicago school officials committed to the $320 million offer even though they couldn't say how the cash-starved system would pay for it. Remember, this is a system that has drained its available reserves and raised taxes to the legal limit. There. Is. No. More. Money. Everyone knows the Chicago Teachers Union response to the CPS offer: No way. •Principals must have the ultimate authority to hire the best applicants for school openings. The union cannot be allowed to dictate that only its members may be considered for teaching jobs. •Teacher evaluations need to be strongly tied to student academic growth, not so diluted that virtually all CPS teachers will pass muster, as they do now, whether they are effective or not. CPS officials tell us City Hall and the district won't cave on those two key issues. They cannot. A strike may last two days or two weeks or two months. But what happens in these contract talks is about Chicago's future. This is about whether 402,000 kids get the education they need to perform well in college — and to compete in their careers. Or whether the teachers succeed in protecting jobs, watering down reforms, and dooming generation after generation of students to languish in classrooms where no one is responsible if a student doesn't learn. For the first time in 25 years, teachers have walked out of classrooms and onto picket lines. They abandoned the children they say they're committed to teaching. They threw families into chaos. They tossed away whatever academic gains had been achieved in the first week of a longer day. When kids go back to school, they'll start from scratch. Next time the teachers claim they had to leave those kids in the lurch in order to provide a quality education for them, ask: How does walking away from the classroom achieve that? And why wasn't a budget-busting 16 percent enough? Chicago is nationally known as a laboratory for innovative school reforms. That's why this strike is grabbing headlines across the country. A union victory here emboldens the forces of the status quo nationwide. CPS must hold the line. That may mean rebooting negotiations: If this strike lasts more than a few days, CPS ought to withdraw its generous offer. Start over. Take back the raises that the system can't afford and insist on a merit pay system. Pay teachers for superior performance, not merely for sticking around year upon year. As is, CPS treats the most ineffective teachers the same as its superstars. Thousands of parents scrambled on Monday morning to find alternatives for their kids. But not parents of 52,000 charter school students — one-eighth of those 402,000 public school students citywide. The charter parents dispatched their kids to school as usual Monday. As they will Tuesday. And Wednesday. Those students attend schools that union leaders vehemently oppose. Why? Because they don't employ CTU members. Once this contract is settled, Priority One for CPS is to make sure this strike is the last one. The best way: Convert a much larger number of CPS schools into charter schools. This strike should produce an overwhelming parent groundswell for more charters in CPS. Many of those parents already were trying fiercely to get their children into charters. The CTU doesn't like to talk about those long waiting lists at charter schools. Nor is the union willing to recognize financial reality in Chicago or the national movement toward education reform. It banks on parents pressuring board members to cave — that is, the union counts on City Hall and CPS to give the CTU whatever it demands to get kids back in classrooms. That's the way it has always been. Mayor Rahm Emanuel, Chicago Board of Education members, don't repeat history. Decade after decade, CPS faintheartedness at the bargaining table has led to early settlement of strikes but never to fundamental reforms. Teachers are on strike. Kids are the losers. The kids are always the losers. This time, make this strike count. Make it a victory for students. Don't cave. Chicago Teachers Union President Karen Lewis has taken her members over the edge. It didn’t have to be. The Chicago school system this weekend put a good — not perfect — but good offer on the table. But the union, clinging to an unrealistic notion of what it can accomplish through labor negotiations, rejected it. From the get-go, the union seemed intent on striking. Sunday happened to be the trigger day. Even late on Sunday night, as Chicago School Board President David Vitale tried to reach Lewis, the union president did not respond to his cellphone text. Lewis says she didn’t see it as she worked the phones with national labor leaders. After announcing the strike, Lewis texted Vitale, asking about their next meeting. Nice to hear talks will continue, but how about a text before the strike announcement? As parents scramble for day care and teachers hit the picket lines starting at 6:30 a.m., we are hopeful the strike will be brief. No, we are not starry-eyed optimists. The strike should be brief because, as we’ve said for weeks, a fair settlement is within reach. The broad contours of a deal were there Sunday night. It’s now up to the CTU to make it happen. The board has already come a great distance. It sweetened the proposed cost-of-living raise, maintained raises for each additional year of experience and softening a new teacher evaluation system slightly. But CTU President Karen Lewis and her bargaining team wouldn’t bite. They are mainly stuck on two issues: teacher recall and teacher evaluations. Emanuel said teachers cannot strike over either issue by law. They’re also still fixated on issues that cannot be resolved at the bargaining table, such as financial resources for schools and wraparound social service supports for students. They are right to fight for these issues — but they are not ones that warrant keeping 350,000 students out of the classroom. Raises: CPS came up only slightly from its latest offer of 8 percent over four years. Sunday’s offer was 3 percent in the first year and 2 percent in each of the next three. The board also caved on “steps,” or annual raises for experience. This is a big give. CPS has offered a modified plan that will result in a 16 percent raise over 4 years. That’s a strong offer in this economy. Recall: CPS has proposed reducing from 10 months to five the time a laid-off teacher gets her full salary while she is looking for a new job. That will save the cash-strapped school system plenty. But the CTU, anticipating dozens of school closings on the horizon, wants a recall policy for displaced teachers. CPS said it would guarantee displaced teachers interviews for openings. That’s a strong start. A resolution shouldn’t be tough. Teacher Evaluation: CTU wants a new evaluation system to place less emphasis on student test scores. CPS has agreed to delay its implementation for one year and to make its implementation in its fifth and final year contingent on agreement with CTU. This could include reducing the percentage of a teacher’s evaluation that is based on student test scores. Again, a strong start basis for an agreement. The next few days will be filled with fiery rhetoric, picketers and distressed parents and children. Don’t get swept up in it. A deal is within reach. All CTU has to do is grab it. EDITORIAL. Chicago Teachers’ Folly, Published: September 11, 2012 on line. In print September 12, 2012. 81 Comments as of 7:00 a.m. Chicago time. Teachers’ strikes, because they hurt children and their families, are never a good idea. The strike that has roiled the civic climate in Chicago — and left 350,000 children without classes — seems particularly senseless because it is partly a product of a personality clash between the blunt mayor, Rahm Emanuel, and the tough Chicago Teachers Union president, Karen Lewis. Beyond that, the strike is based on union discontent with sensible policy changes — including the teacher evaluation system required by Illinois law — that are increasingly popular across the country and are unlikely to be rolled back, no matter how long the union stays out. Mr. Emanuel attracted the union’s anger when the city, citing budget deficits, rescinded a 4 percent raise that was supposed to go into effect last year. He further angered the union by bypassing the collective-bargaining process with a new policy that lengthened one of the shortest school days in the nation. Comparatively speaking, however, Chicago’s teachers are well paid, with an average salary of about $75,000 a year (roughly the same as in New York City). Before the strike, the city agreed to increase the size of the teacher corps to handle the longer school day. And despite its dismal fiscal condition, the city says it has offered the union a 16 percent raise over the next four years. The union has listed several grievances in its public statements, but the main point of anger has to do with a state law that requires school systems to put in place an evaluation system in which a teacher’s total rating depends partly on student test scores. Half the states have agreed to create similar teacher evaluation systems that take student achievement into account in exchange for grants under the federal Race to the Top program or for greater flexibility under the No Child Left Behind law. Such systems are already up and running in many places. In Chicago, however, the union asserts that the city’s evaluation system will unfairly penalize teachers for fluctuations in student performance that might be attributable to family crises or even neighborhood violence. For its part, the city says it is willing to monitor the new system to ensure fairness and negotiate a grievance process that would allow the teachers to challenge their ratings. If the union has legitimate suggestions for how to improve the fairness and accuracy of the evaluation system, in particular, it needs to bring them forward in a way that does not involve holding the city hostage. Another big sticking point has to do with the treatment of teachers who are laid off from schools that are closed or consolidated. The city rightly wants principals to determine which teachers are hired at a given school. The union wants a recall system that gives laid-off teachers priority in rehiring. The national trend, however, is going the other way, with systems increasingly giving principals a stronger voice in determining the makeup of the schools’ staff members. What stands out about this strike, however, is that the differences between the two sides were not particularly vast, which means that this strike was unnecessary. Moreover, Ms. Lewis, who seems to be basking in the power of having shut down the school system, seems more inclined toward damaging the mayor politically than in getting this matter resolved. If the strike goes on for much longer, the union could pay a dear price in terms of public opinion. with iron fillings would be the tools used to change the world forever. “We The People “on a piece of vellum it was the end of the beginning. We had to do this for our city our nation ourselves and especially for our students. I am fairly certain that my student are currently supporting me in my endeavor for a fair contract, wrap around services, air-conditioning in our classroom, which I have measured at 98 degrees on some days, and still very hot on many more days. They told me so before our Strike Day. They told me they were with us and that they hoped we succeed. And this is after class, as I refused to talk about this during our class time together saying "I hope we don't strike and I hope to see you Monday." In seeing the support that we are getting from parents, their children, and regular working class people, on the north, south, and west side, I am filled with pride in being an American, in a Democracy, and I am overwhelmed by the support of everyone we have encountered in Chicago, with a few exceptions of course: a shout out: sir on Ridge near Touhy this morning in the expensive sports car, "Thanks for stopping and not running me or the 2 ladies I was escorting across the street this morning. I appreciate your nifty break work, after speeding up quite a bit and bearing down on us. The few feet of space you gave us was indeed welcomed!" The Powers that be can and will attempt to take our Democratic rights away from us. They will try to divide us. And to conquer us. Standing Proud and standing Strong!